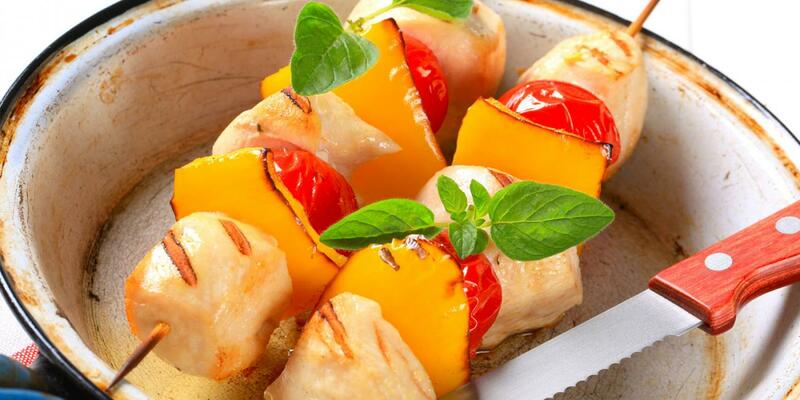 This recipe is high in protein with chicken and vitamin C with fruits and vegetables! Vitamin C may help prevent cellular damage in joints, while olive oil has also been shown to improve bone and joint health. The Good Housekeeping 400 Calorie Chicken © 2013 by Hearst Books, an imprint of Sterling Publishing Co., Inc.
Preheat large ridged grill pan or prepare outdoor grill for direct grilling over medium heat. Pound chicken to an even 1/2-inch thickness. Season with 1/4 teaspoon of the salt and 1/8 teaspoon of the pepper. From limes, grate 11/2 teaspoons of peel and squeeze 3 tablespoons of juice. In a small bowl, combine peel, 1 tablespoon juice, oil, 1/4 teaspoon salt, and remaining 1/8 teaspoon pepper. Brush tomatoes and peppers with oil mixture and place on hot grill pan on rack. Place chicken on pan or rack. Cook chicken and vegetables 8 to 9 minutes, turning over once. Vegetables should be browned and tender. Chicken breasts should be browned on both sides and no longer pink throughout; instant-read thermometer inserted horizontally into thickest part should register 165°. Serve chicken and vegetables with avocado salsa; garnish with fresh cilantro leaves.